I admit to loving the back more than the front. 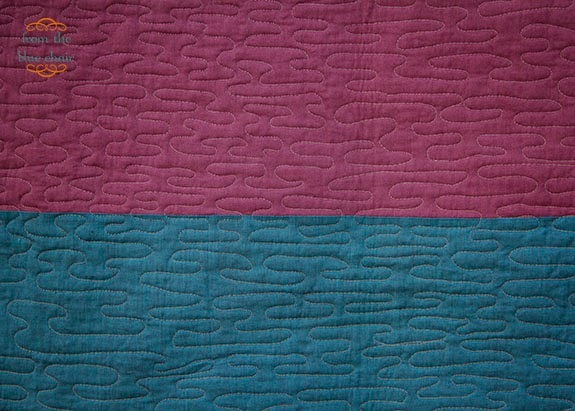 I used Kaffe Fassett shot cottons which are much more beautiful in person than in photos. I love the depth of color on these. 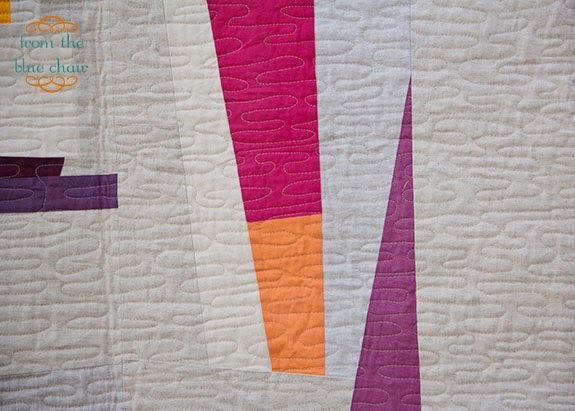 My quilting inspiration came from Katie's great quilting series over at Swim, Bike, Quilt. Fabrics: Too many different colors to count, pulled from seven different solid charm packs as well as my solid scraps. Solids are from at least five different manufacturers. The neutrals come from at least five different linen or linen blend fabrics. One thing is pretty much certain. I won't be piecing many more 1" squares for a long while. I've had enough of these tiny squares for now. If anyone is interested in my leftovers, leave a comment. I'll randomly select the recipient and send you a bunch of 1 1/2" squares to make your own confetti blocks! You know how they say "time heals all wounds"? You will come to love this quilt - it's really awesome. Oh my goodness, me! I think your tiny squares are exquisite! I love this quilt. I love using squares that size. Send them along! I love, love, love this.... an new project for my to do list! That's awesome! I'd love the scraps. Fun! No! Don't you dare love the back more! (Because total strangers are always qualified to tell you just how to feel . . . .) The back is great, but the front is fantastic! Those choppy vibrant parts are perfect. Love it. You may not love it yet, but I do! 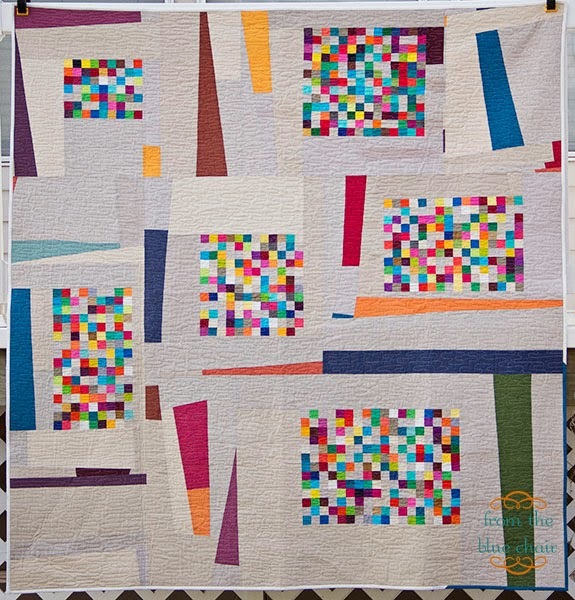 I think the tiny squares surrounded by the large improv pieces makes the little ones stand out and the pops of color in the big pieces lead your eye around the quilt. Your leftovers are lovely, I'm sure I could use them for some of the scrappy things I make. I might be insane but I love the idea of a challenge like that! And I think your quilt came out amazing. 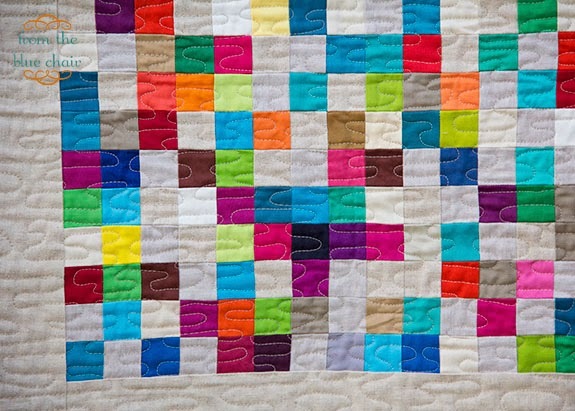 Love, love, love this quilt!!! I love your quilt. I think this is something even my picky daughter would love. Thanks for the giveaway. I love this quilt too!! And blocking it with the improve pieces was brilliant! Ooh, I'm gathering 1.5 inch squares for a project and would love to have your extras. Thanks! The little confetti blocks are so fun! I'd love to turn your leftover squares into a confetti pillow! 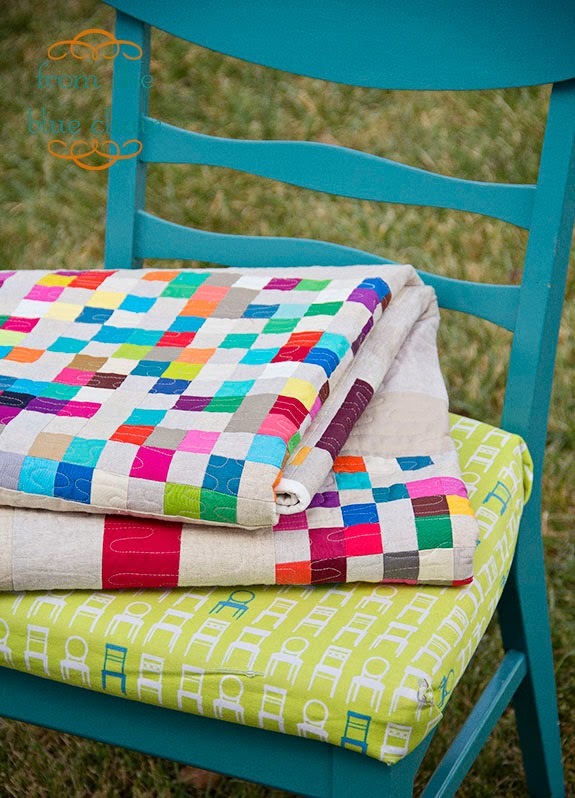 Love this quilt, it is my type of modern, I would really like some of your leftover squares. I would love your leftovers!! I have a pixel quilt in the works that these would be perfect for! I love this, fabulous funky colours. You never know until you try. If you decide you really don't like it I know a where you can find a lovely home for it. I really like how it turned out. I like the quilt! I think it's a really fun way to add improv to structure! Hopefully it will grow on you! Beautiful quilt! I think it is amazing and would love to play with some tiny squares myself! Ooh, I'd love to play with all your little left over squares! Pick me please. I'd totally take them! Hooray solids! I love it! I especially love how you broke up the intensity of the blocks with all the improv piecing. This is an amazing design. I kinda want your scraps. I just did a pillow with 1.5' prints. Not sure if Im ready for a whole quilt yet, but quilted pillows are fun. Love little scraps! Your quilt looks beautiful! I am so NOT interested in receiving your scraps...I just finished a 34" pillow with one inch pieces! It looks great, not scrappy, but enough is enough! I like how you put the whole quilt together after it was all you wanted to do. I like your Kaffe on the back as well! I say turn the darn thing over if you like the back better! I personally don't like white or solids for much snd not a real scrappy lover, but I do love the way you put that modern twist on it! Beautiful work, Kati! I have a weakness for teeny pieces so feel free to send them my way! Someday I want to make a quilt from a cross stitch pattern, finishing at 1/2". I'm totally crazy, I know. Maybe from a photo. I like how you framed it with the improv piecing. It's a fun piece! I love where this quilt ended up! So interesting - and great movement! Also, I have a tiny scrap addiction so I always have room for 1.5" squares... And a long term project that uses them...! Gorgeous on the back & the front!! Maybe it's like childbirth? You need some distance to forget the pain before you want to do it again?? LOL I'm sure this quilt will grow on you. It is a striking quilt. Also, it's so interesting to see how far the quilt changed from your original project. It would be lovely to get some of your leftover little squares, they would be great for a quilt a have in mind. Haha - I don't want your 1" squares thank you! I really like the front (though the back is sensational!). I think that the back and front go really well together; busy, energetic front and a calm, serene back! I really really love this quilt. You shold too! ;) You inspired me to make a pixel pillow. Yes very interested!! The smallest I've worked with is 2-1/2", the inch would be interesting... Your quilt is beautiful!! I'll make some confetti blocks!!! I love the tiny squares, and would enjoy making some confetti blocks myself! That is one awesome quilt~!! I really love the confetti quilts interspersed with the improv areas - brilliant! And the quilting is perfect for this - enough movement for some organic softness, but nothing detracting from the power of the improv and confettis. Yeah, you're going to fall in love with this when you're recovered from the brutality of the piecing. :D I've been saving scraps for a while to one day make an insane 1"er of my own. I too love the wide open spaces surrounding your confetti squares. Very clever and colorful! This quilt is so fun! I find the front to be intriguing and I could look at it for hours. The framing of the blocks is perfect, sharp edges, yet random sizes and shape. A nice offset to the perfectly pieced squares. I rather enjoy tiny piecing but within limits. Looks like you've found yours! 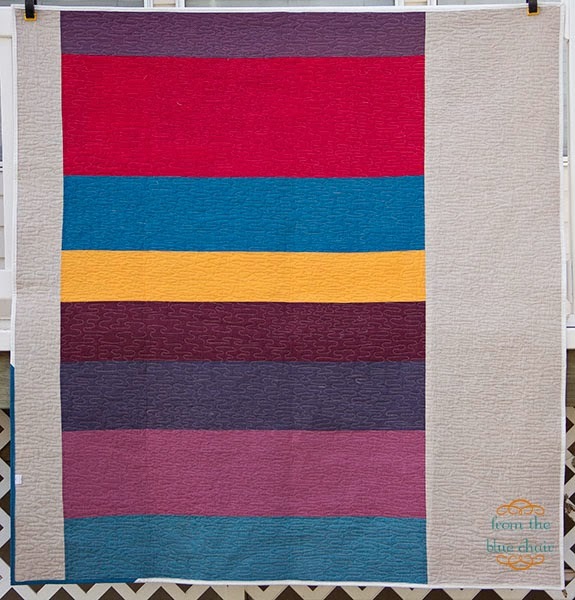 I think this quilt is wonderful and I know what you mean about the process. Sometimes even if you don't love the result the process was the right thing to do, if that makes sense. I like your quilt and I'd love to win the leftover squares. I've wanted to make a pixel quilt for a long time now and these would be a great way to start. I love solids, and tiny squares! Good work persevering with your blocks. Love your quilt, love making quilts but my worst part is the cutting out! 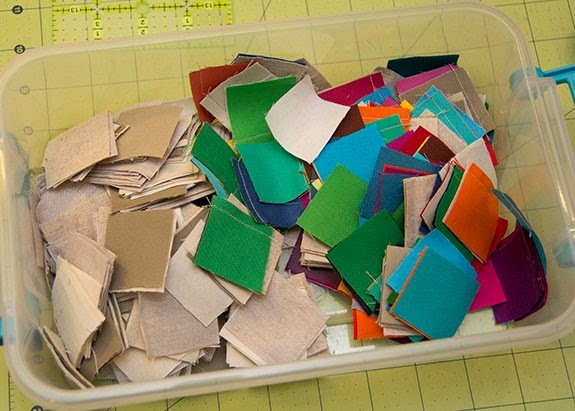 Would love the chance to get my hands on some pre cut little squares-and such pretty colours too!!! Muito lindo seus trabalhos!!! Denise Coelho - Brazil.